Great property, location, and staff! Breakfast in the morning was great and the room was very well equipped. perfect location in porto. old house very but good room. nice stuff. The staff was extremely friendly and we loved the convenience of location to bars and restaurants. Our room 403 was incredible, so spacious and convenient with the terrace to the garden. The most comfortable bed as well! The location was within a short walk of the train station and the metro which connected to a line to the airport. Very convenient for walking throughout the entire city. We used the Sauna and the Steam Room, which were excellent. The Roman Bath is not like a jacuzzi in temperature, but it is an interesting experience. We stayed on the 4th floor and were in a room overlooking the pedestrian zone. Yes, there is music in the late afternoon, but we weren't hanging in the hotel for too long. This is a wonderful property and I would recommend it. We made a reservation for lunch at Vinum at Graham's and would also recommend that! Great location. Maria was the best! She helped us map out what we could see in a short period of time. The studio was large and had a full kitchen. Would be great for a long stay. There was a walk-out to a patio and table/chairs. The interior design was elegant modern and the stunning view of the castle outside our widow will be memorable. The reception staff was excellent, extremely helpful (especially maria). The room was clean and comfortable and the location was great! Everyone was helpful, they showed me where to go and what to do! location is good, close to everywhere. staff is kind. Lock in a great price for Flores Village Hotel & Spa – rated 9 by recent guests! Flores Village Hotel & Spa This rating is a reflection of how the property compares to the industry standard when it comes to price, facilities and services available. It's based on a self-evaluation by the property. Use this rating to help choose your stay! One of our top picks in Porto.Located in the heart of Porto, Flores Village Hotel & Spa is set on an 18th century historical building and offers a complete wellness center with a sauna and an indoor pool. Mixing contemporary and antique décor, this property provides free WiFi. Flores Village includes a variety of apartments and rooms. Each accommodations is equipped with air conditioning, soundproofing, telephone, flat-screen cable TV and a mini-bar. The private bathrooms are complete with a bidet, a hairdryer, a bath and free toiletries. The apartments are spacious and include a fully equipped kitchenette that guests can use to prepare their own meals. In addition, the property provides a room service and breakfast in the room. A bar is also available where guests can socialize and relax after spending a day exploring the city. 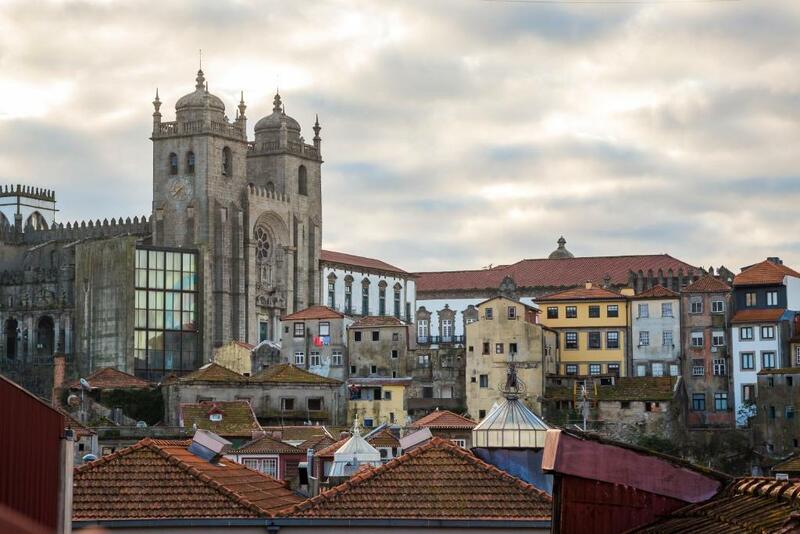 Additional facilities provided by the Flores Village Hotel & Spa include a hammam, a massage service, car and bicycle rental, shuttle service, ironing, laundry and a tour desk where guests can get information about the most interesting places to visit in Porto. Guests can easily visit some of the most iconic landmarks of the city including the Clérigos Tower and the Lello Bookstore, both just a 5-minute walk from the hotel. The World Heritage Ribeira area with its restaurants, bars and cafés is 1,800 feet away and the São bento Train Station is a mere 700 feet away. Porto International Airport is 9.9 mi away. When would you like to stay at Flores Village Hotel & Spa? This air-conditioned double room features a private bathroom and a cable TV. Tea and coffee are available in the room free of charge. Please note that rooms with balcony are subject to request and availability. This air-conditioned apartment features a double bedroom and an private bathroom. The living room has a double sofa bed, a dining area and opens to a fully equipped kitchenette. Tea and coffee are available in the room free of charge. This air-conditioned apartment features a double bedroom and an private bathroom. The living rooms has a double sofa bed, a dining area and opens to a fully equipped kitchenette. Tea and coffee are available in the room free of charge. Please note that apartments with balcony are subject to request and availability. This studio has a mini-bar, kitchenware and microwave. This apartment has a bathrobe, mini-bar and microwave. House Rules Flores Village Hotel & Spa takes special requests – add in the next step! Flores Village Hotel &amp; Spa accepts these cards and reserves the right to temporarily hold an amount prior to arrival. Flores Village Hotel & Spa accepts these cards and reserves the right to temporarily hold an amount prior to arrival. Please note that Rua das Flores is a pedestrian street open to traffic from 06:30 to 11:00. The property suggests guests parking their car at a paid car park, Cardosas Car Park, located 800 feet from Flores Village. For further information, please contact the property. Please note that a 10% discount voucher is offered to guests to use at Pateo das Flores Restaurant at lunch or dinner on the à la carta menu (set menus not included). Great central location. Peaceful gardens to relax. Breakfast was good. Gym ok. Spa ok. Very nice staff and tries to accommodate us. Indoor roman bath was perfect for the kids on a rainy day. There could be more variety for breakfast. They give you every day the same things at the buffet: some scrambled eggs/fried eggs, some cheeses, ham, bacon, and a bunch of English breakfast stuff (hot beans, mushrooms). There's some milk and cereals too and deserts. Coffee comes from an automated coffee machine and is obviously not that great. They could provide some better options there as well. Another thing that could be improved is the opening time for the spa. Right now they have it open from 8 A.M. until 8 P.M. which means that if you are going for a day trip somewhere you're most likely not going to benefit from the spa at the end of the day which is a pity. Location was excellent, right in the centre, close by to most attractions. The garden in the back of the hotel is also great. Too bad the weather wasn't so good to enjoy it more. The spa is a nice addition as well. Breakfast was tasty, especially the deserts! Beds in the hotel were super firm, unable to get a good nights rest. Rooms were not cleaned well, cobwebs, dust plus a piece of dry bread in the patio which was there for the duration of our stay. Bathroom shower thermostat had a mind of its own. Superb location close to all the major attractions. Ask for a room at the rear if you're a light sleeper. The one downside of being in the lively neighborhood is a bit of nighttime noise. Fantastic location, lots of restaurants nearby and a short walk to all the attractions and Sao Bento train station. Delicious breakfast and lovely wine bar downstairs. Huge room, very clean. Highly recommended. Breakfast could be opened earlier than 8am. The breakfast could be better, the eggs didn’t taste great so we only ate the pastries and yogurt. The annex is a bit far from the main building although has a direct access from outside. Have expected warmer water temperature at the roman baths. Overall, overpriced. Central localisation on a busy street. Good breakfast under high ceilings. Friendly staff.